Unlike many other computer languages Lisp is interactive. 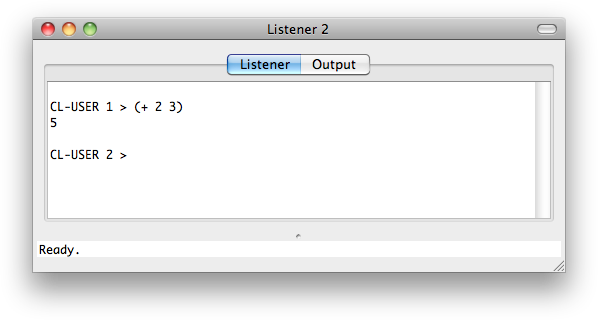 It includes a window called the Listener which you can use like a calculator. You can type a Lisp expression at the ">" prompt, press return, and the system will evaluate it and show you the answer. As you probably guessed (+ 2 3) is Lisp's way of adding the numbers 2 and 3, so it displays the result 5. The second prompt shows that it's ready for more. In Lisp + is called a procedure. It is the operation to add numbers. In normal maths we write 2 + 3, but in Lisp we put the procedure name first, followed by the arguments, with the whole expression in brackets. This is called prefix notation, and although it seems strange, it's one of the best things about Lisp. Another beauty of prefix notation is that it allows us to express almost everything we need, from simple calculations to complicated programs. 2. Write an expression that will give a random dice throw from 1 to 6.